This mega-mural is 80 feet high and spans four industrial buildings along the Trail. The artist mixes his street graffiti roots with museum-quality design to create this bright and bold landmark art piece. Photographers of all ages and experience levels submitted their work that captures the truth of the people who live, work and play in Hagerstown. Not sure where to start? Let our map guide your way and introduce you to what’s to come on the Hagerstown Cultural Trail! 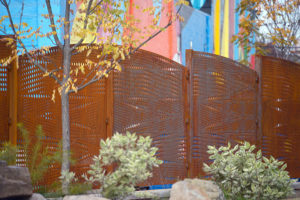 A nationally known infrastructure artist is creating the plasma-cut steel fence design based on railroad imagery, recalling the busy railroad yards that one occupied this land. 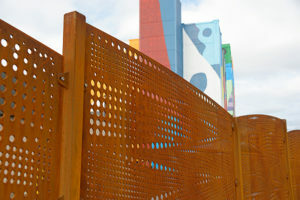 The fence provides a backdrop for the HHA sculpture garden area and visually screens it from Ellsworth Electric’s parking lots and loading docks. 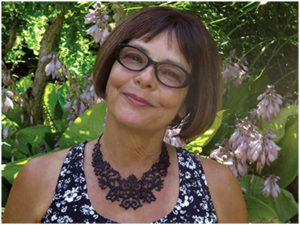 Bio: Educated in printmaking and design, Vicki transformed her studio work into large-scale public installations as a member of the Downtown Seattle Transit Artist Design Team. 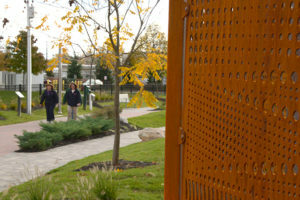 This program catalyzed her interest in collaborative work and public space. It marks the beginning of her practice, Vicki Scuri SiteWorks. 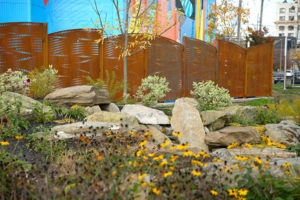 Her primary focus is site responsive, collaborative design and Public Art, with emphasis on community identity through awareness of place, history and culture. Her practice specializes in infrastructure as public place, because infrastructure, best symbolized as the backbone of urban design, is the system upon which society builds its core values, creating meaning, mobility and connectivity. Having participated on over fifty design teams across the United States, she continuously hones her skills as an artist and collaborator. Hagerstown Cultural Trail 2019 | Powered by WordPress.